Chuck Perrin, owner/manager of San Diego jazz club Dizzy's, reunited his Beat.itude co-horts last year to re-make their 1995 CD into a live performance DVD. It's a relaxed, warm and yet still very engaging set of jazz-rock fusion with a slight Latin tinge to it. 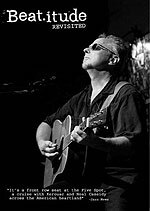 Perrin plays guitar and sings, and has a soft voice not so different from that of Michael Franks, giving the songs a folky feel. The rest of the band, though, is firmly ensconced in the jazz world, and are world-class. Bob Magnusson isn't just one of the most technically brilliant jazz bassists on the planet (and the guy played for both Buddy Rich and Sarah Vaughan in his youth), but one of the most impassioned. Seeing him on video, singing to his big standup bass as he plays, adds a new dimension to our appreciation of his remarkable playing. Tom Aros, Duncan Moore, Daniel Jackson, Mitch Manker, Arthur Fisher, Dave Curtis and Patrick Armenta combine with Perrin and Magnusson to make this a sort of San Diego all-star combo. The video production is solid, the sound outstanding.